For devoted owners of pampered pups seeking the next level of doggy luxury, help is at hand. A jewel-encrusted canine castle, a velvet-lined golden egg and a floating doghouse complete with diving board are just some of the elaborate kennel designs concocted by dog-loving architects and designers to be auctioned off this month in aid of the pet charity Blue Cross and the US-based Outdoor Arts Foundation. Zaha Hadid Design has turned its expertise in streamlined space-age forms to the humble dog basket, producing a curvaceous cocoon, machine-milled from plywood with the retro-futuristic air of something from the Jetsons. 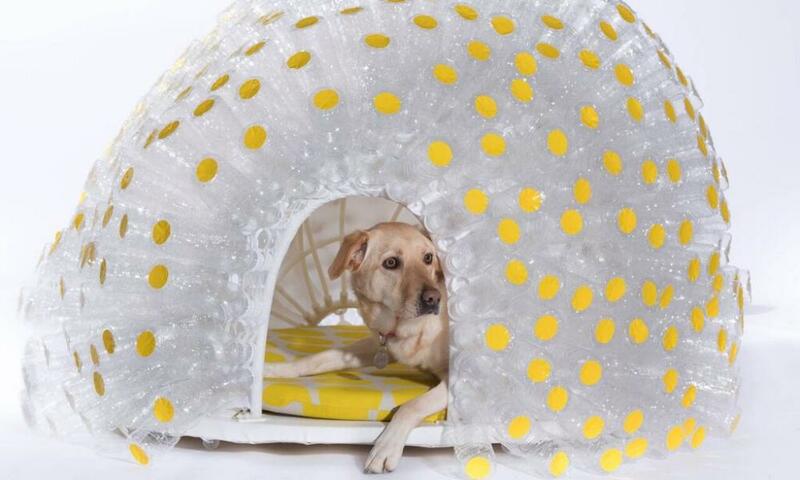 Spark Architects’ design is equally sci-fi in form, but much more low-tech in execution, comprising an amoebic blob of a kennel made out of 500 recycled plastic bottles. 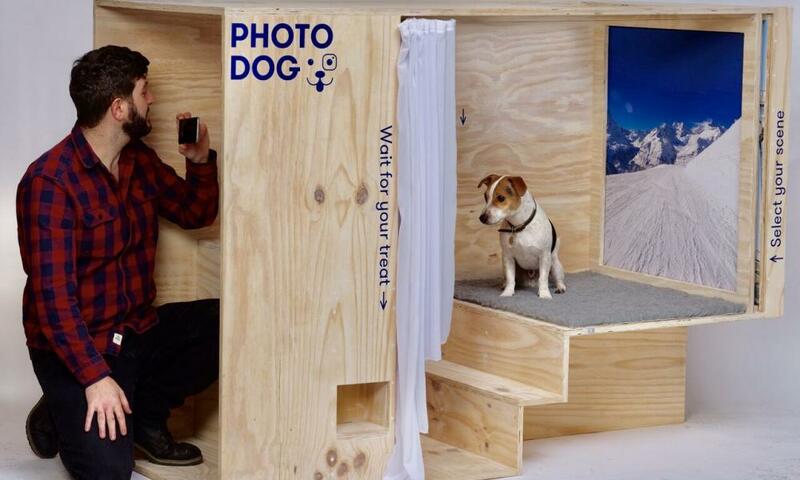 For selfie-obsessed pets with their own Instagram accounts, Studio Shaw has designed a doghouse that doubles as a photo booth, with changeable backdrops of exotic scenery to inspire travel envy among fellow mutts. Other designers have raided the dressing-up box. 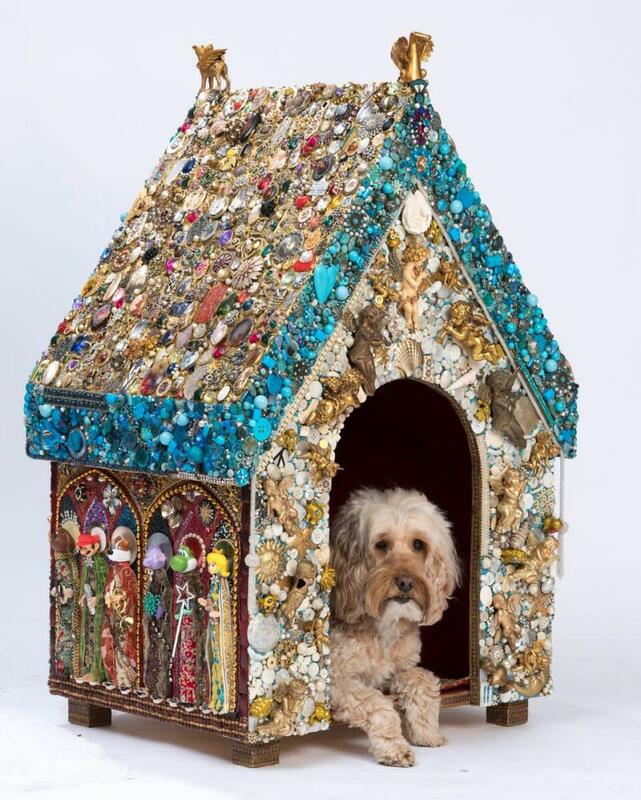 The Florida artist Eileen Goldenberg has built a miniature castle with more than 20,000 pieces of gold and silver costume jewellery gathered from her travels around the world, while Jane Perkins has made a folksy shrine to St Roch, the patron saint of dogs. Inspired by the roadside shrines of southern Europe, which are often shaped a bit like dog kennels, her tiny temple is smothered with buttons, beads and other found objects in honour of the Catholic saint, who is said to have survived the plague after a dog licked a wound on his thigh. Keeping up the saintly theme, the young architecture practice Russian for Fish has worked with the model makers at Shepperton Studios, who built the original Star Wars stormtrooper costumes, to craft a beguiling onion dome kennel inspired by St Basil’s Cathedral in Moscow. A handful of celebrities have also lent their design skills to the initiative, with varying degrees of success. Fearsome quiz-mistress and cocker spaniel fan Anne Robinson has teamed up with the corporate firm Condy Lofthouse Architects to come up with a prosaic yellow and white shed. Ben Fogle has joined Green Tea Architects to create a nest-like structure wrapped with green string, while swimmer Rebecca Adlington has worked with Studio Octopi, the architects of the proposed Thames Lido, to design “the world’s first amphibious kennel”, inspired by the architecture of Miami lifeguard stations. The designer kennels will be on display in St Pancras and Stratford stations in London, where they will no doubt liven up the commute, but might make passersby wonder if the designers’ energies might have been better placed elsewhere. The BowWow Haus auction takes place on 26 April at the St Pancras Renaissance London Hotel, with more on the kennels here.